Share your Picture and Story about your experience in Indonesia! INDONESIA is a land of cultural diversity and beautiful landscapes! With more than 17,000 islands, there is a lot to show the world! Unique diving experiences, road-trips with motorcycles or even drinking the water from a fresh coconut, we hope you all had wonderful moments in Indonesia. We are curious about your favorite moments and experiences and would really appreciate if you share them with our community. 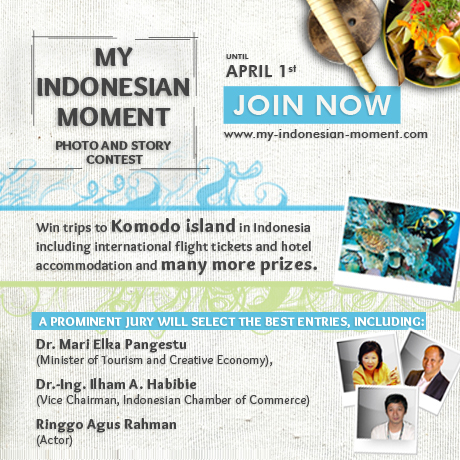 Therefore we have created the “My Indonesian Moment” Contest! This contest is about your experience, your magical and most memorable moment in Indonesia. We are happy to receive your picture or story or both describing your best moments. Whether you have spent your honeymoon in Bali, hiked Mount Bromo in Java or ate at delicious food at local restaurants in Padang – The Indonesia’s cultural diversity is as large as its diversity in tourism destinations. At the same time this contest is a starting point of our journey to innovate and co-create Indonesian tourism in the future. Indonesia has much more to offer than you might imagine. And we would like our local and international guests and friends to co-create their travel experience with the help of the locals as well as by joining in idea discussions with the crowd. In follow up projects you are most welcome to share your ideas for your next trip ideas or travel schedules as well as some hidden secrets and hotspots. There is always a room to innovate, so don’t miss your chance to contribute to these contests! 1. Photos Did you take a picture on your last trip to Indonesia? Have you captured the beauty of our nature, a portrait of local people, spectacular buildings in Java, a clubbing experience in Bali or even took your camera down under the sea to capture a coral reef? Whether you are a professional photographer or just a passionate shooter, your pictures will be inspiring and valuable in helping to promote the best of Indonesia to the world. 2. Stories Did you forget to bring your camera on your last trip or have you experienced something that you can’t express in a single picture? Do you want to share some stories the local people told you while you were traveling? Or you simply don’t have a picture of your best moment? No worries use your imagination and let us take part. Submit the story of your experience in Indonesia. When was it? And where? Share your thoughts and let them inspire fellow travelers. 3. WHY DO YOU HAVE TO JOIN? What is your benefit? The best, funniest and most creative pictures will be used virally for the ITB Berlin in March 2013, where Indonesia is this years’ official partner country at the world’s largest travel fair. You can help us promoting Indonesia and we are happy to display your work and portfolio. In addition you can win valuable prizes and further experience the unique diversity of Indonesia. See below for more information on the awards. 4. WHAT IS THE ITB BERLIN? It is the world’s leading travel trade show and will take place in Berlin, Germany this March 6th-8th2013. Varieties of traveling and tourism will be presented from all over the world, including: Cultural Tourism, Adventure, Business and travel days and eTravel World. So what are you waiting for, take the chance to have your photos and stories exhibited to 11,000 exhibitors from 180 countries and to over 170,000 visitors and 7000 journalists! Creativity – fresh, interesting, intriguing photos taken creatively by the photographers’ perspective. Uniqueness – how does the picture differentiate from others? Is there a unique technique? Or are the photos taken at a very unique or hidden location? Professionalism – quality, clarity, angle, lighting and the clear center of interest portrayed in the picture. Content – does the photo tell a story? Uniqueness – does the story inspire? Does it play in a very unique or hidden location? Professionalism – is clearly written, flowing throughout the story. Content of the story – is it funny, dramatic or inspiring? In the idea pool, you are also free to give comments, to ask and to answer questions and to be involved in discussions. The community members can rate and ask some questions while the owner of the photos or stories will have the opportunity to further share their experiences and tips. 1. Click register on the Homepage and fill in the information or Click f-connect button to immediately connect to your Facebook account. 7. Submit your photo or story or both! By agreeing to the Terms and Conditions you are then eligible to be a member, participate in the contest and have the chance to win the prizes. All intellectual property rights to the suggested solutions (e.g. text, graphics, images, stories, descriptions etc.) presented by you as part of a contest on the Homepage belong to you. With your submission you grant the Ministry of Tourism the right to communicate your entry in any way through any media, including but not limited to the home page, and also in connection with exhibitions, events, etc. Discover with us the beauty of Indonesia and help co-creating the future of Indonesian Tourism.